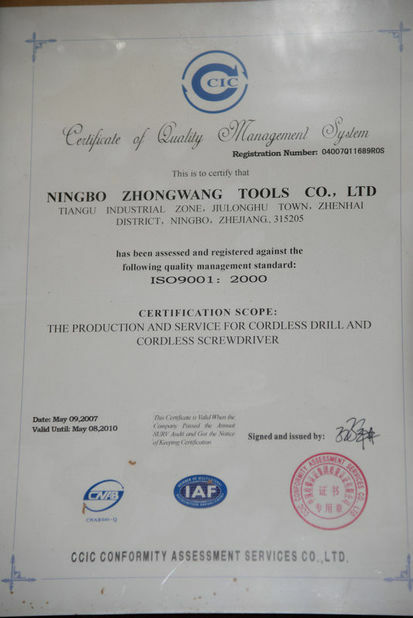 NingBo ZhongWang Tools Co., Ltd. is located in the east of China and we are a professional manufacturer and exporter of cordless power tools, hand tool sets and other tools. Initially founded in 2005, we have over 10 years of industrial experience. After years of investment, we have built prototype workshop, testing lab and a strong engineering group. Now, Zhongwang Tools perform the entire process from computer design, prototype develop to the finial PPAP. 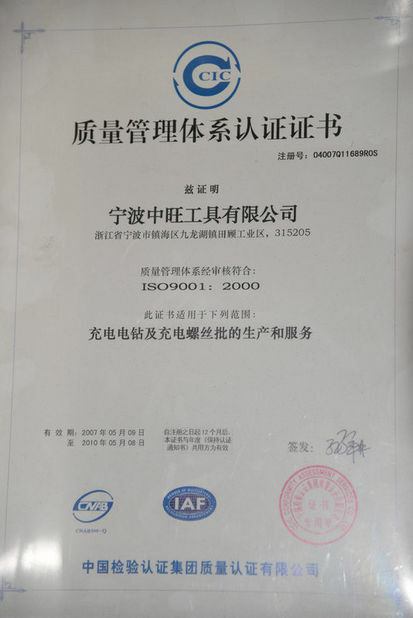 With the commitment of strict quality control and healthy manufacturing management we obtained ISO 9001:2000 certificate. Over years of development, we have our products exported to Europe, North and South America, Mid-East and Asia Pacific with safety certificates of GS/CE/EMC/ROHS/UL/SAA/BS/PAH's. Seeking for potential business cooperation, you are welcomed to visit our corporation! Initially founded in 2005, we have over 10 years of industrial experience. Our company mainly engaged in Cordless Drills,Screwdriver,Hand Tool Set,Garden Tools Kits,Power Tool Set Etc..We are committed to providing customers with high-quality products and satisfactory services. Welcome to contact us for more information.Looking forward to cooperating with you! We believe “the only wealth of the company is our team.” For 10 years, we have spared no efforts in looking for the best talents to add to our family. Now, we have constructed a compact yet competitive team in our company. With this highly experienced experts, ZW has mastered nearly all the state of DC power tools. By intelligence and persistence, we are truly confident that ZW will soon be the most trustworthy supplier of power tools in this fast changing world.